When it comes to the foods you eat, you have choices. One of those choices has to do with how far the food traveled before it made it to your dinner plate. In this article, you will see the flow of food from farm to plate and consider the potential problems associated with the system and the likely inevitable impending consequences for relying on our flimsy system. Consider the travel of a single vegetable before it makes it to your dinner table. Once harvested, bushels are loaded on an oil dependent farm truck that brings it to the plant for oil dependent machine washing and processing. From there, the farms final product is loaded into a fuel dependent climate controlled container by a fuel dependent fork lift. 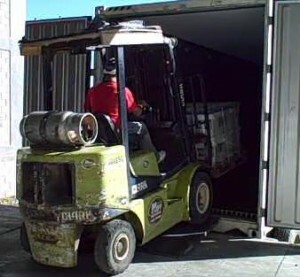 The container changes hands for the first time as it is picked up by an oil dependent 18 wheeler. The trucking company transports the container to the port where the container is moved by an oil dependent crane and loaded on an oil dependent ship. Will you eat from these containers? 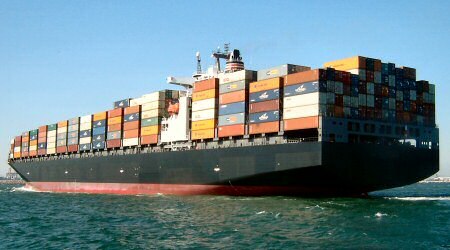 The ship is pushed across the ocean where the container can again be lifted by crane to land where it can again be picked up by a climate controlled 18 wheeler for transportation to an oil dependent facility owned by the one who purchased the container of vegetation for resale of the contents. From there, the whole process starts all over again as the foods are often processed and changed, repackaged into smaller packages and then redistributed in oil dependent climate controlled trucks where they will change ownership to new oil dependent owners. If we are lucky, the new owners are the central distribution centers for our grocery stores. They will assemble various food products together to fill up an oil dependent climate controlled 18 wheeler that is sent to the grocery store where it can be unloaded by oil dependent forklifts and eventually moved to the store shelves. We then get in our oil dependent climate controlled vehicles and drive to our oil dependent grocery stores where we exchange money we don’t own for vegetation that isn’t real, and this we give to our children – something is wrong! Lord Cameron of Dillington, a British farmer, coined the phrase “nine meals away from anarchy”. He explained that if our fuel supply was suddenly interrupted, the transportation of food to the stores would be interrupted and the grocery stores would be out of food within 3 days. Although, they would probably run out faster due to the human nature of panic shopping. You see, whether meats, dairy, or vegetation, our food supply is oil dependent. 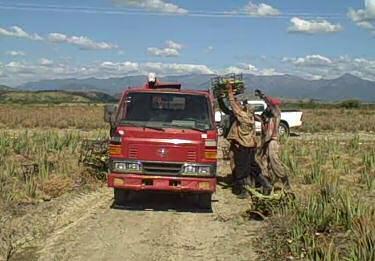 Farming is done with tractors and machinery that is mostly oil dependent. Our foods then travel great distances to make it to the grocery stores. Much of it travels oversees before it even makes it to central distributing locations. It can pass through many middlemen before it finally makes it to us. What is the practical solution? Consider Growing Local. (You have to see the video on the “Growing Local” page! It seems that running, the most fundamental exercise, is also one of the most controversial. Should you run? Isn’t it bad for your knees? I have known many people that say they can’t run because of their knee problems. But I don’t know of any that developed significant knee problems because of their running. When I ask them how they hurt their knees, I have heard of almost everything you can think of including water ski jumping, snow ski wrecks, parachuting, car wrecks, motorcycle wrecks, football injuries, and even a bull riding fall. But I have never heard of anyone injuring their knees from just years of running or even competing in track and field. That doesn’t mean it can’t happen. But as a physician, I personally have never seen it. Of course overuse pain syndromes are real among runners. But that is usually due to someone increasing their distance faster than their body could adapt to the change. This type of knee problem is usually helped by ice and rest. (never put ice or an ice pack directly on the knee but rather use towel separation. Never ice a knee longer than 15 minutes at a time. If you over-trained and suffer from “Runner’s Knee”, you will probably recover faster if you stretch appropriately; especially your quadriceps and hamstrings. an “anti-inflammatory” diet is also certainly beneficial. I am not really a fan of mundane distance running anyway. Distance running can be challenging and beneficial to some extent. And at slow speeds, distance running can be great for burning fat. But if you want to really drive the metabolism and increase your growth hormones to professional athlete levels, you will probably want to include some sprint work on your running days. Running sprints involves near maximum exertion usually to the point of a significant oxygen deficit. That means that at some point you will have to slow down so your body can catch up and meet its’ oxygen demand. It will usually only take 20 to 30 seconds of sprinting to work up a significant oxygen deficit. This is the type of training that has been shown to effectively increase hormone levels to those of younger people and athletes. Before making changes to your exercise program, be sure to consult with a physician to discuss the changes you will be making and make sure those changes are right for you. Published by admin, in exercise, nutrition. “Mujadarah” aka “Jacob’s Stew” is one of my favorite dinners. It is a traditional recipe passed down through the generations and based on the story in Genesis 25:29-34. The first time my wife made it for me, it brought to life this story. It is a truly wonderful aromatic recipe that is absolutely delicious. I can understand how a famished Esau could forsake all reason to indulge in such a wonderful meal. The Holy Bible: New International Version. 1996 (electronic ed.) (Ge 25:29–26:1). Grand Rapids, MI: Zondervan. For our family I usually double this recipe.